All of our rings, bracelets, necklaces, and earrings from Charmed Aroma valued under $300 have a solid, 925 sterling silver base with 100% AAA cubic zirconia jewels. Rings valued over $300 are made out of real gold and diamonds and are accompanied with a Certificate of Appraisal. For security purposes, this jewelry is represented by a ticket that can be used to redeem these high valued prizes. Certain Charmed Aroma jewelry styles are plated meaning that a surface coating of another metal has been applied on top of the piece. The type of metal we use for plating is rhodium; a precious metal belonging to the platinum group of metals. 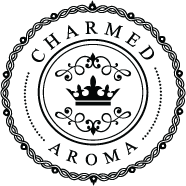 Charmed Aroma’s rose gold, black gold, and champagne gold jewelry is plated with rhodium. The coating of rhodium ensures a bright, durable and scratch resistant surface which can be polished to a high shine. Do not polish aggressively as it will only serve to wear away the plating. With time the plated finish will wear away which is considered normal wear and tear rather than a defect.